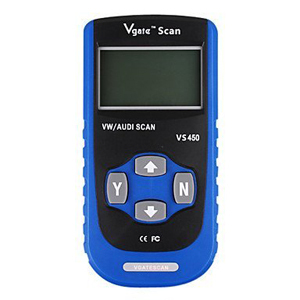 The Vgate SuperScan VS450 Scantool is an original equipment manufacturer (OEM) level diagnostic tool for the majority of post 1990 Volkswagen/Audi models, it replaces the obsolete VAG405 which is no longer produced. The EOBD function means the VS450 will also operate on non Volkswagen/Audi vehicles, although not to the same extent. Easy to use, with an intuitive interface, the VS450 reads, scans and clears/erases on board diagnostic (OBD) and fault/diagnostic trouble codes (DTC) including those of the engine and transmission, ABS, immobiliser, airbags, A/C/climate control, radio, steering wheel instrumentation, central locking, etc. This stand-alone unit communicates safely and easily with on board computers, displaying results on a large, backlit LCD screen the VS450 has a comprehensive menu of tests and diagnostics. With Controller Area Network capability (CAN) the VS450 reads, scans and clears/erases using ISO 15765 (CAN), ISO 9141-2 (CARB) and ISO 14230 (KWP-2000) protocols.